1.1. This policy explains when and why we collect personal information about our customers, how we use it and how we keep it secure and your rights in relation to it. 1.4. We will always comply with the General Data Protection Regulation (GDPR) when dealing with your personal data. Further details on the GDPR can be found at the website for the Information Commissioner (ico.gov.uk). For the purposes of the GDPR, we will be the “controller” of all personal data we hold about you. 4.1. We will not transfer your personal data outside the EEA without your consent. 4.3. Please note however that where you are transmitting information to us over the internet this can never be guaranteed to be 100% secure. 4.5. We will notify you promptly in the event of any breach of your personal data which might expose you to serious risk. 5.2. 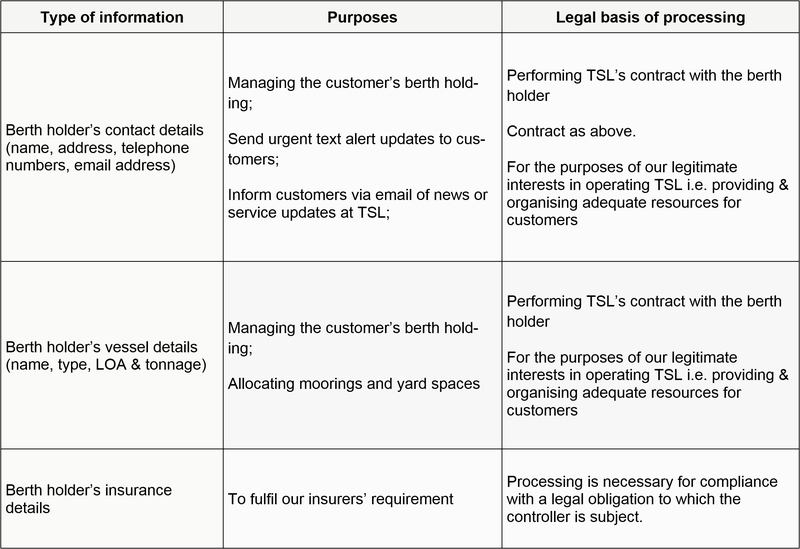 We may share your information with third parties who are service providers, agents and subcontractors to us for the purposes of completing tasks, fulfilling the contract between us and providing service updates to you on our behalf (e.g. to print newsletters and send you text alerts & mailings). However, we disclose only the personal data that is necessary for the third party to deliver the service and we have a contract in place that requires them to keep your information secure and not to use it for their own purposes. 6.1. 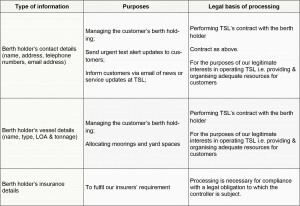 We will hold your personal data on our systems for as long as you are a berth holder of TSL and for as long afterwards as is necessary to comply with our legal obligations. We will review your personal data every year to establish whether we are still entitled to process it. If we decide that we are not entitled to do so, we will stop processing your personal data except that we will retain your personal data in an archived form in order to be able to comply with future legal obligations e.g. compliance with tax requirements and exemptions, and the establishment exercise or defence of legal claims. For further information on how your information is used, how we maintain the security of your information, and your rights to access information we hold on you, please contact The Directors in writing via email at data@fact.org.uk , or at our postal address Tollesbury Saltings Limited, The Sail Lofts, Woodrolfe Road, Tollesbury, Essex CM9 8SE. We may make a small charge for this service.